A regular breeding resident and migrant. The Forster’s Tern was an uncommon species during the Minnesota Breeding Bird Atlas (MNBBA). Although it is an emblematic species of the prairie potholes, the Forster’s Tern breeds in scattered locations throughout North America, ranging from the Canadian Prairie Provinces south to the Gulf coast. The tern is never abundant anywhere; some of the highest breeding concentrations are found in southern Manitoba, northern California, northern Utah, and along the Gulf coast of Texas and Louisiana (Figure 1). Assigned a Continental Concern Score of 13/20 by Partners in Flight and designated a species of Moderate Concern by the North American Waterbird Conservation Plan; officially classified a Special Concern Species in Minnesota and listed as a Species in Greatest Conservation Need by the Minnesota Department of Natural Resources. A short- to medium-distance migrant; southern coastal populations are permanent residents; northern coastal populations and interior populations are migratory and spend winters along the southern coasts of the United States south through portions of Central America. An aerial diver that feeds primarily on small fish, insects, and crustaceans; birds also catch insects on the wing. A platform of aquatic vegetation constructed atop dense emergent vegetation, floating vegetation, or old muskrat houses. A colonial nester. Breeding distribution and relative abundance of the Forster’s Tern in North America based on the federal Breeding Bird Survey, 2011–2015 (Sauer et al. 2017). In the early 1900s, Roberts (1932) described the Forster’s Tern as a common summer resident on prairie sloughs and marshes across the state’s western grasslands. Confirmed nesting records were available only from Heron Lake in Jackson County and from King Lake in Meeker County, but his account also noted breeding colonies in Kittson and Renville Counties. The large number of birds observed each spring in southeastern Minnesota suggested to Roberts that the birds migrated up the Mississippi River valley and then headed west and northward across the prairies. By the summer of 1940, reports from the Twin Cities would confirm the birds were nesting even farther east than originally presumed. The first report was the discovery of a small colony of approximately 25 pairs with young on Otter Lake in Ramsey County (Engstrom 1940). The second was a single nest found in a backwater lake of the Minnesota River, immediately south of Minneapolis (Mitchell 1941). The author of the latter account also mentioned a known nesting attempt that same summer in Chisago County. Although nesting would never again be reported from Chisago County and would be documented from Ramsey County only through 1963, Hennepin County would continue to support small numbers of breeding birds (Minnesota Ornithologists’ Union 2016). When Green and Janssen (1975) prepared their updated account of the tern’s status, the species was described as a regular breeding species in western and central Minnesota. Little had changed when Janssen (1987) published another updated account of the species’ status several years later. The only change of note was the recent establishment of a relatively large breeding colony at the Wood Lake Nature Center in Richfield (75 breeding pairs in 1975). Despite an extensive, three-year survey of the Upper Mississippi River, from Goodhue County to Houston County, Janssen reported that only 3 tern nests were found in the backwaters of the Mississippi River south of Wabasha in 1984. Janssen (1987) identified 20 counties in the western and central regions of the state where Forster’s Terns had been confirmed nesting since 1970. When Hertzel and Janssen (1998) published an updated map of counties where nesting had been confirmed since 1970, they identified only 19 counties. Excluded from Janssen’s original map were Becker, Goodhue, Murray, and Redwood Counties; new counties added were Kandiyohi, Otter Tail, and Washington. Coincident with these updated accounts, in the late 1970s the Minnesota Nongame Wildlife Program in the Minnesota Department of Natural Resources (MNDNR) issued a series of four technical reports that were an effort to assemble a comprehensive inventory of all colonial waterbird nesting sites in the state (Henderson 1977, 1978, 1984; Henderson and Hirsch 1980). The reports were a compilation of information from MNDNR field staff, local and federal resource agencies, and colleges and universities. Published accounts also were compiled. The combined results of these technical reports were summarized by Guertin and Pfannmuller (1985), who reported that 15 Forster’s Tern colonies were known to be active in the state in 1981, 1982, or 1983. The colonies were distributed across 13 counties stretching from Jackson County in the south, north to Marshall County, and east to Hennepin and Scott Counties. Ten of the 15 colonies supported fewer than 50 nests. The largest colony was located on Lake Osakis in Todd County, where the nesting population was estimated at 1,000 pairs in 1983, but just one year later, the colony had declined to only 200 pairs. The status of 6 additional colonies that had not been surveyed since 1980 could not be confirmed. Although there were few quantitative data, the reports prepared by the Nongame Wildlife Program coupled with the experience of numerous field biologists and lifelong birders led biologists to believe that the species had declined significantly in the past 40 or 50 years. Most active colonies were relatively small; even the larger colonies only regularly supported 100 to 300 nesting pairs. As a result, the Forster’s Tern was officially listed as a state Special Concern Species in 1984 (Coffin and Pfannmuller 1988). Nearly 25 years later, MNBBA participants reported 157 Forster’s Tern records in 2.4% (116/4,737) of the surveyed atlas blocks and in 2.4% (56/2,337) of the priority blocks. Breeding was confirmed in 15 blocks; 3 of these blocks, however, were immediately adjacent to another block and represented just 1 nesting colony each. Hence, the total number of colonies reported was 12 (Figures 2 and 3; Table 1). In total, the birds were reported from 42 of Minnesota’s 87 counties and were reported nesting in 11 counties. Conducted approximately 30 years after the compilation prepared by Guertin and Pfannmuller in 1985, the MNBBA provided a reasonable data set to compare with the compilation to assess changes in the intervening years. The MNBBA data suggest that the Forster’s Tern has a nearly identical distribution today as it did in the 1980s. Guertin and Pfannmuller (1985) reported 15 active colonies distributed across 13 counties; the MNBBA reported 12 breeding localities distributed across 11 counties. Unfortunately, the number of nesting pairs supported by these sites is unknown, but it is likely still below 1,000. Distributional changes elsewhere in the Forster’s Tern’s breeding habitat are not well documented. In their comprehensive review of the species’ status, McNicholl et al. (2001) noted that the ephemeral nature of the tern’s nesting habitat “blurs distinction between changes in breeding distribution and long-term fluctuations.” In Wisconsin, the largest decline in the species’ distribution and abundance occurred by the middle of the 20th century. The loss of floodplain marshes along major waterways was particularly detrimental. Since then, populations of this now rare summer resident have been limited to a few key nesting sites restricted primarily to eastern Wisconsin (Cutright et al. 2006). Breeding distribution of the Forster's Tern in Minnesota based on the Breeding Bird Atlas (2009 – 2013). Summary statistics of observations by breeding status category for the Forster's Tern in Minnesota based on all blocks (each 5 km x 5 km) surveyed during the Breeding Bird Atlas (2009-2013). Summary statistics for the Forster's Tern observations by breeding status category for all blocks and priority blocks (each 5 km x 5 km) surveyed during the Minnesota Breeding Bird Atlas (2009-2013). Although they are often referred to as “marsh terns,” Forster’s Terns can be found in a wide variety of wetlands, ranging from freshwater and saline wetlands to the marshy shorelines of lakes and rivers. But in the interior Great Plains, it is the prairie potholes and sloughs where this species is most at home. Here they are found in extensive wetlands where emergent vegetation is abundant and widely interspersed with open water for foraging (Figure 4). They share these productive sites with myriad other wetland-loving birds, including Pied-billed Grebes, American Coots, Black Terns, and Yellow-headed Blackbirds. Forster’s Terns usually select the deeper waters of most wetlands, nesting atop old muskrat houses or floating mats of vegetation, or on the root bases of cattails (McNicholl et al. 2001). In Minnesota, the 15 active colonies studied by Cuthbert and Louis (1993) were, with one exception, all located within semipermanent or permanent wetlands. In rural areas, all but one of the suitable wetlands were 700 ha or larger; the 2 colonies in the Twin Cities metropolitan region were 49 ha and 55 ha each. Forster’s Terns generally do not demonstrate a high fidelity to their breeding sites. Changing water levels, high winds, and storms can easily render their open-water nesting sites unsuitable. As a result, it is not uncommon for them to select other suitable sites at the beginning of the nesting season or to abandon sites midseason and attempt to renest elsewhere (Cuthbert and Louis 1993; Fraser 1997; Wires et al. 2010). Typical Forster’s Tern breeding habitat in Minnesota (© Lee A. Pfannmuller). As for most colonial waterbirds, population data are scant. This is particularly true for open-water nesting species like the Forster’s Tern, whose nests are often interspersed with emergent vegetation in large wetland complexes that are difficult to access. Although the species usually nests in colonies, many colonies are quite small, numbering just 10 to 20 pairs. Some sites may support just 1 to 3 nesting pairs. Biologists responsible for the North American Waterbird Conservation Plan estimated the North American population of Forster’s Terns at 47,000 to 51,000 breeding individuals (Kushlan et al. 2002). Wires and her colleagues (2010) estimated the population in the Upper Mississippi River and Great Lakes Region Joint Venture area (which includes eastern Minnesota) at 5,400 to 5,800 breeding individuals, the majority of which occur in the Great Lakes (71%–74%). The population estimate for the Prairie Pothole Joint Venture area (which includes western Minnesota) is 3,175 breeding individuals (Beyersbergen et al. 2004). As noted earlier, in the 1980s, Minnesota was believed to support less than 1,000 breeding pairs, or 2,000 individuals (Cuthbert and Louis 1993). 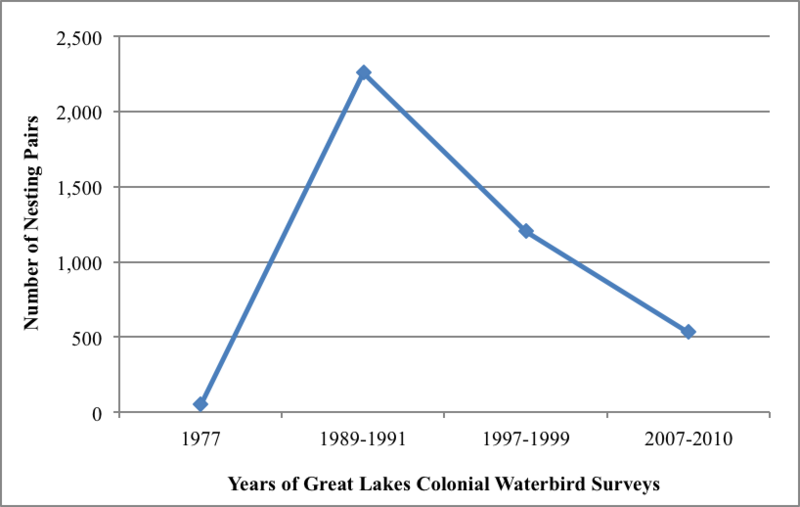 With regard to population trends, long-term population monitoring has been conducted by the Great Lakes Colonial Waterbird Survey (Cuthbert and Wires 2013). The census has conducted counts approximately every 10 years since the mid-1970s. These data show a decline of 56% in Forster’s Tern numbers between the censuses conducted in the late 1990s and the one from 2007 to 2010; the number of colonies decreased from 13 to just 3 (Figure 5). Although data collected by the federal Breeding Bird Survey (BBS) lack some reliability because of the species’ relatively low abundance on BBS routes, they also show a long-term, nonsignificant population decline survey-wide of 1.60% per year since 1966; from 2005 to 2015, however, the trend has reversed and increased an average of 3.22% per year (Sauer et al. 2017). Major threats to Forster’s Tern populations are the loss of suitable habitat, which is particularly problematic during drought years; pesticides and other contaminants; and human disturbance at colonies. Although individual colonies may be threatened by changing water levels, predators, and storms, the Forster’s Tern employs the adaptive strategy of quickly relocating and reinitiating nesting at another suitable site (McNicholl et al. 2001; Wires et al. 2010). Nevertheless, at a regional scale these threats can significantly influence breeding populations if suitable habitat is unavailable. In the core of the Twin Cities metropolitan region, for example, the Forster’s Tern has not successfully nested for more than two decades, as storm-water runoff has consistently rendered suitable sites unacceptable. Forster’s Tern population trend in the Great Lakes (Cuthbert and Wires 2013). The Forster’s Tern was designated a species of Moderate Concern in 2002 by the North American Waterbird Conservation Plan (Kushlan et al. 2002) and recently assigned a Continental Concern Score of 13/20 by Partners in Flight (2017). Major concerns that influenced the latter score included its population decline, its small population size, and threats to its breeding habitat. In Minnesota the species has been officially listed as a Special Concern Species since 1984 (Coffin and Pfannmuller 1988). Several other states in the Great Lakes region also have classified the species as endangered or special concern, including Wisconsin, Michigan, and Illinois (Wires et al. 2010). It is also designated a Species in Greatest Conservation Need by the Minnesota Department of Natural Resources (2015). Dependent on suitable wetlands, the Forster’s Tern, like so many species in the northern Great Plains, is vulnerable to the impacts that result from warming temperatures. Wetlands in the region are projected to decline by nearly two-thirds (North American Bird Conservation Initiative 2010), forcing wetland-dependent birds farther north. A recent modeling effort by the National Audubon Society that examined the impacts of climate change on nearly 600 North American birds classified the Forster’s Tern as “climate threatened.” Models predicted that by the year 2080, the species could lose more than 80% of its current summer breeding range (Langham et al. 2015; National Audubon Society 2016). Concerted efforts to protect and restore wetland habitats are critical. Statewide initiatives, including those undertaken by the Minnesota Prairie Conservation Plan (Minnesota Prairie Plan Working Group 2011) and the Minnesota Duck Recovery Plan (Minnesota Department of Natural Resources 2006), are more important than ever in this region. In Minnesota, it is especially important to insure that large nesting colonies that have been used consistently over the years are both protected and monitored. These sites are Agassiz National Wildlife Refuge in Marshall County, Clearwater Lake in Wright County, Lake Osakis in Todd County, North Heron Lake in Jackson County, and Swan Lake in Nicollet County. Despite widely fluctuating populations on each of these sites in 1985 and 1986, together they comprised 90% and 92% of the estimated state population in each respective field season (Cuthbert and Louis 1993). All but North Heron Lake were documented nesting sites during the MNBBA. Most of these sites are important to a host of other wetland-dependent species, so periodic monitoring would serve multiple purposes. Cuthbert, Francesca J., and Mei-Yao Louis. 1993. “The Forster’s Tern in Minnesota: Status, Distribution, and Reproductive Success.” Wilson Bulletin 105: 184–187. Engstrom, Hugh R. 1940. “1940 Minnesota Nesting Records.” Flicker 12: 46–52. Fraser, Gail. 1997. “Feeding and Nesting Behaviors of the Forster’s Tern on Lake Osakis, MN.” MS thesis, North Dakota State University. Mitchell, Earl T. 1941. “Nesting of Forster’s Tern in Hennepin County.” Flicker 13: 19.